Na na na na na na na na, na na na na na na na na Lego Batmaaaaaaan! I love this movie. I love this silly, silly movie. A spin-off of 2014’s The Lego Movie, The Lego Batman Movie takes one of the best parts of that film and gives him a full film to stretch his legs. But if you are worried that the joke of Lego Batman being super intense and extreme all the time might wear thin over a full running time, you might be pleasantly surprised. Unlike many other Batman parodies that came before it, this film balances the larger-than-life central character with a strong supporting cast and a lot of clever writing. Between the obvious affection for the characters and all of the mythos gags in the script, this movie was clearly made by people who love Batman, but do not put Batman on a pedestal. But what about the other half of the title, the “Lego” part? 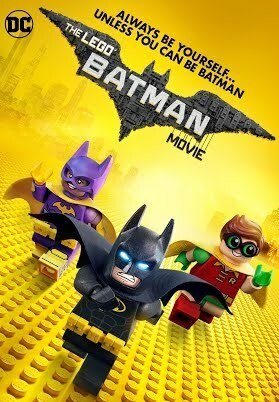 I was a fan of how the original The Lego Movie used its conceit, pinning the story around the act of creation, but for most of this film, this seemed like a Batman movie that could have been made with any type of animation, not specifically modeled after Legos. However, once the movie had lulled me into forgetting I was watching little plastic toys act out comics lore, the climax was built brilliantly around how the characters are literally Lego figures and can be used as Legos. Add into that the fact that the Lego company apparently had free reign to use any intellectual property that they have made figurines of, and it gets pretty surreal and amazing. If you ever want to see the Joker have a canon conversation with Voldemort and the Wicked Witch of the West, this is your movie. It’s not perfect. The last third drags a bit and I wish Barbara Gordon had some more quirks of her own rather than being relegated to the empathetic straight man role. But the dry sense of humor had me cackling at a ton of points and Will Arnett is an amazing voice actor for this role (remembering he also plays the clinically depressed BoJack Horseman made this a bit of a trip to watch). The film is shockingly clever and snarky for a big budget animated film about a product placement, but what can I say? Good writing is good writing. Would I Recommend It: Ooooh yes. Previous Less than a week to support “As Told By Things”!